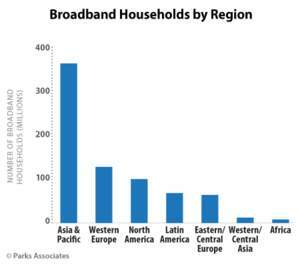 DALLAS, TX--(Marketwired - May 4, 2016) - Parks Associates announced a new research report today that estimates broadband adoption will reach 84% of U.S. households and 79% of Western European households in 2016, after both regions reached 50% penetration in 2006. Global Connected Living Outlook: Pursuing the IoT Promise notes that this widespread access to high-speed data services is the main catalyst to growth in the connected home and consumer-based IoT, which is attracting major players, including Amazon, Apple, Google, and Facebook, in areas such as home entertainment and connected CE, smart home and security, apps and mobile devices, and connected cars and healthcare. "Over the last 30 years, Parks Associates has seen the concept of the connected home expand to include new form factors while still retaining that core vision of delivering a superior consumer experience," said Barbara Kraus, Director of Research, Parks Associates. "Given the market leadership positions of these larger companies in their core businesses and the extensive ecosystems they have built, their entry into the connected home ecosystem will help accelerate growth in established categories and emerging technologies such as wearables, smart fabrics, and virtual and augmented reality." Apple's HomeKit-certified devices hit the market in 2015 from brands such as ecobee, August, INSTEON, and Lutron. The initial success of the Amazon Echo led to integration of its Alexa natural language processing platform with several smart home control platforms and stand-alone devices, including SmartThings, Wink, INSTEON, and Philips Hue. Facebook has announced its intent to help developers build IoT apps that power smart devices using the social network's Parse software, which could ultimately be controlled by consumers through the Facebook platform. "Adoption of the connected lifestyle continues to expand as the supporting technologies mature and the value propositions of smart, connected devices and streaming services are better understood by consumers," said Brad Russell, Research Analyst, Parks Associates. "The groundwork is laid for continued growth in 2016 and beyond by increased access to fixed and mobile broadband and improved resolution of interoperability challenges by more collaborative, though fragmented, communications networks." For more information about this research, visit www.parksassociates.com. To schedule an analyst interview or to request specific data, contact Holly Sprague at hsprague@gmail.com, 720.987.6614.